OPENING DAY ! SEASON 3 ! It’s official ! 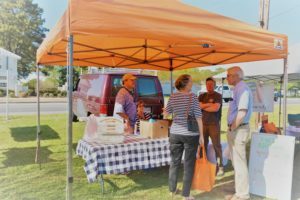 As of Tuesday afternoon , Season 3 of the Cape Charles Farmer’s Market has kicked off – 3 to 6 pm every Tuesday, rain or shine, hot or cold, from now until October. Lots of our favorite venders from last year were there including Shore Beef and BBQ whose motto is – – Dinner’s Ready ! 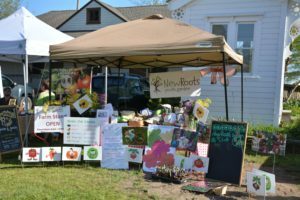 Mattawoman Farms had a big display of organic bedding plants for sale plus multiple varieties of beautiful lettuce, carrots, kolorabi, baby spinach. 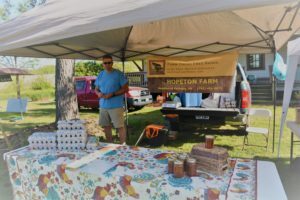 Copper Cricket Farms, Perennial Roots Farms, Hopeton Farm, all were back again with all kinds of veggies, meats, aromatic herbs, preserves and more, all from their Eastern Shore farms. From Pickett’s Harbor Farm, succulent spring asparagus was on offer. Fresh brown eggs were in abundance at many stands. W T Wilkins, aka The Honey Guy, from Old Town Neck was back with his jars of golden nectar. We stopped to talk to him about his bees- – turns out he tends between 12-15 hives with up to 30,000 bees per hive at peak population ! That’s a lot of Eastville busy, busy, buzzy bees making pots of local honey, lucky for those of us who love it. 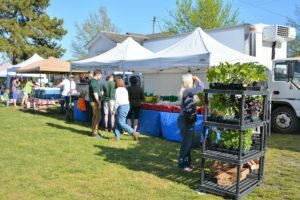 Master Gardeners of the Eastern Shore were on hand with information and advice on how to acquire a Green Thumb and GIY, grow it yourself ! Parisian Sweets was back with lovely homemade French style macaroons in several flavors including a colorful aqua shaded “Birthday” flavor. Birthday in a Cookie- don’t leave the Market without it ! Had hoped for a loaf of flavorful sourdough from Riverside Farms Bakery but they won’t be there till next week, can hardly wait, so wonderful warm, dunked into an olive oil-balsamic dip ! Kitchen Sync, headquartered at the Eastville Inn, returned, some savory soups, salads and a beautiful emerald green pesto for sale. 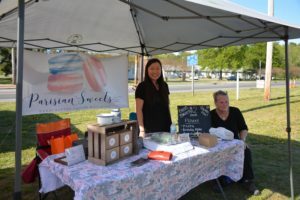 They have a special weekly menu and take orders that customers can pick up every Tuesday at the Market. 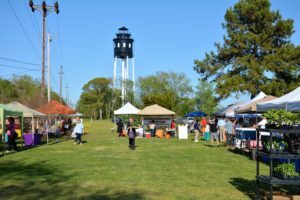 New this year were Edward’s Seafood, here come the crabs, clams and other tasty items from local waters! Also new, Umm Yummies offering delicious and beautifully decorated cupcakes and cookies. Ummm… Yummy ! So…. don’t forget to mark your calendar. 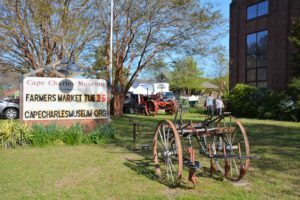 Next Tuesday, when the clock strikes 3, it’s time to grab your market basket and head on over to the Cape Charles Farmers Market at the Museum on Randolph Avenue and fill it with some of the Shore’s amazing bounty. 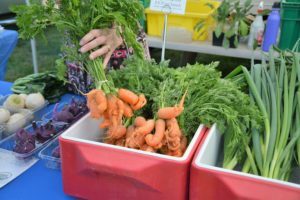 How fantastic is it to have this farm-to-table Market, the opportunity, all season long, to buy everything fresh, fresh, fresh and local ! We love it ! 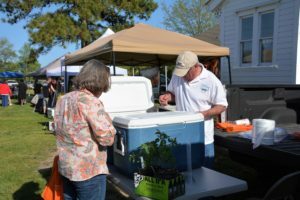 This entry was posted on Friday, May 4th, 2018 at 11:19 am	and is filed under Crafts, Events In Cape Charles, farming, Gardening, Just Having Fun, Odds and Ends, Our Little Towns. You can follow any responses to this entry through the RSS 2.0 feed. Responses are currently closed, but you can trackback from your own site.